Fiji is a tropical paradise, only 10% of which is land and as a collection of 322 islands. 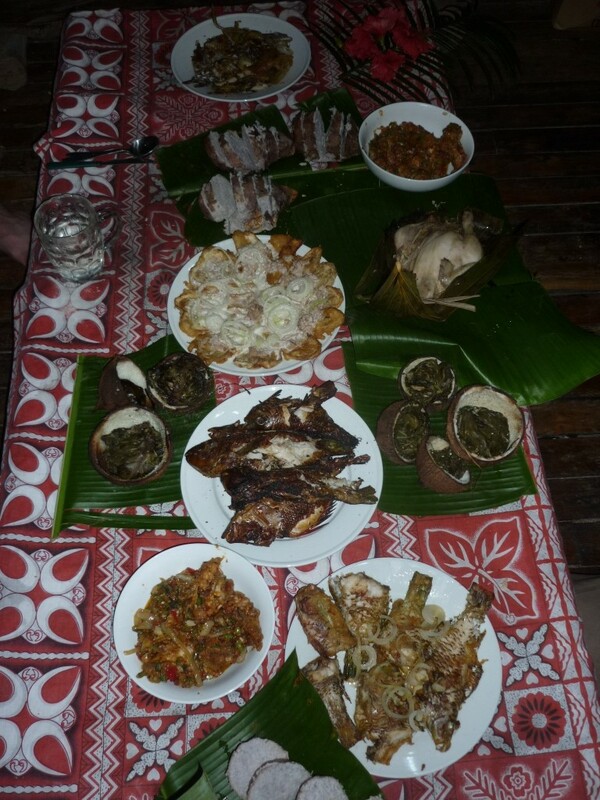 Unsurprisingly then the local food in Fiji use fish as the dominant feature. This is accompanied heavily by coconut in all of its different forms. Shredded coconut, coconut water and cream are all used heavily in the preparation of food. In general, native Fijians and the Fijian-Indian populations use their hands to eat. Meals are eaten on the floor while the family sits on mats. If you make a Fijian meal to share this month, consider incorporating these eating these informal customs into your mealtime. 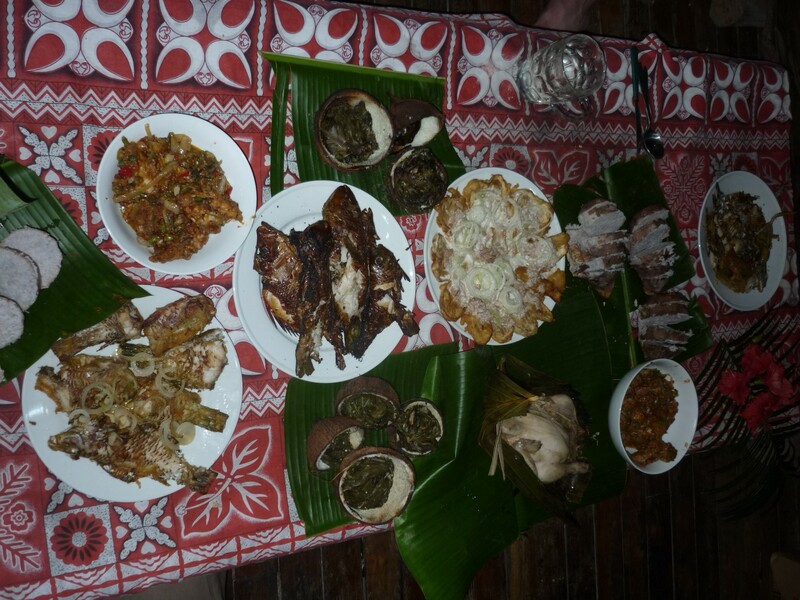 Local food in Fiji can be a communal affair. For example a village feast for special occasions such as weddings, festivals or the inauguration of a new chief is common. 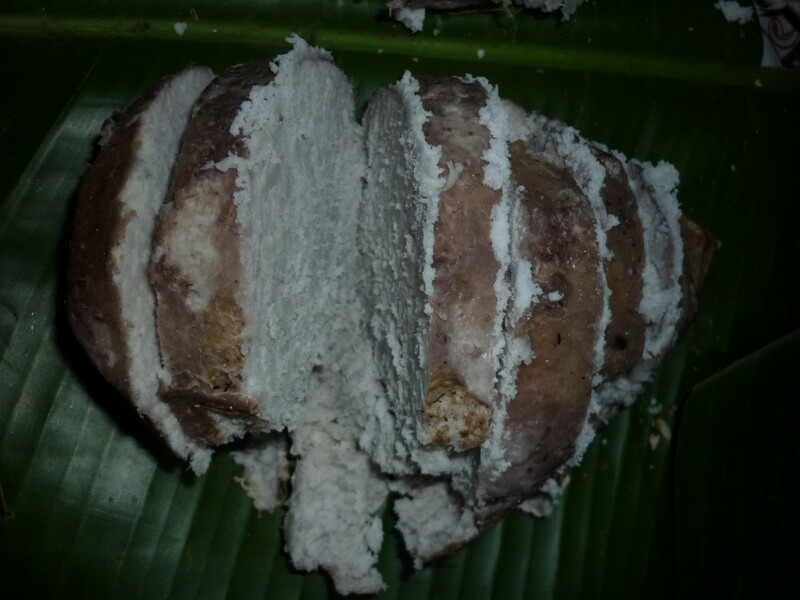 A Lovo is prepared by digging a large pit and lining it with dry coconut husks. The husks are set on fire, then stones are heaped on top. 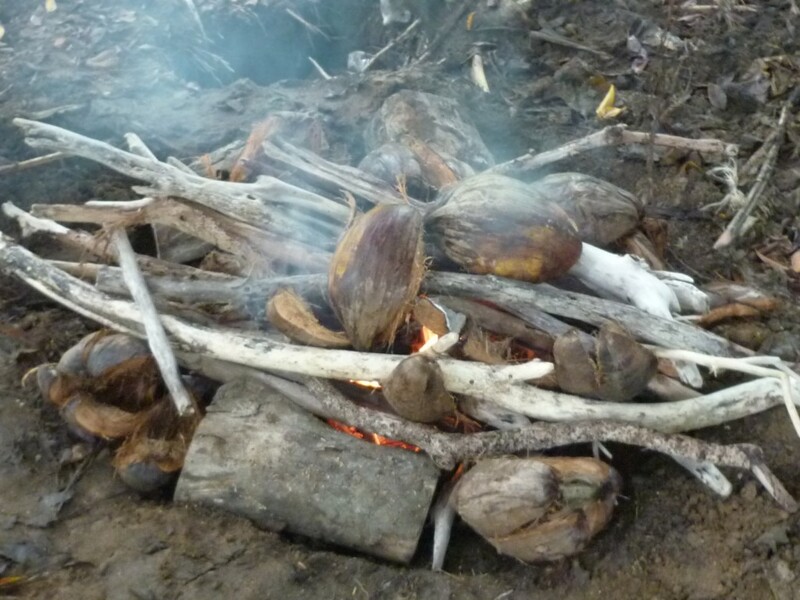 When the flames from the coconut husks die down, the food is wrapped in banana leaves and lowered into the pit. Meat and fish are always put in first, and the vegetables are put on top. 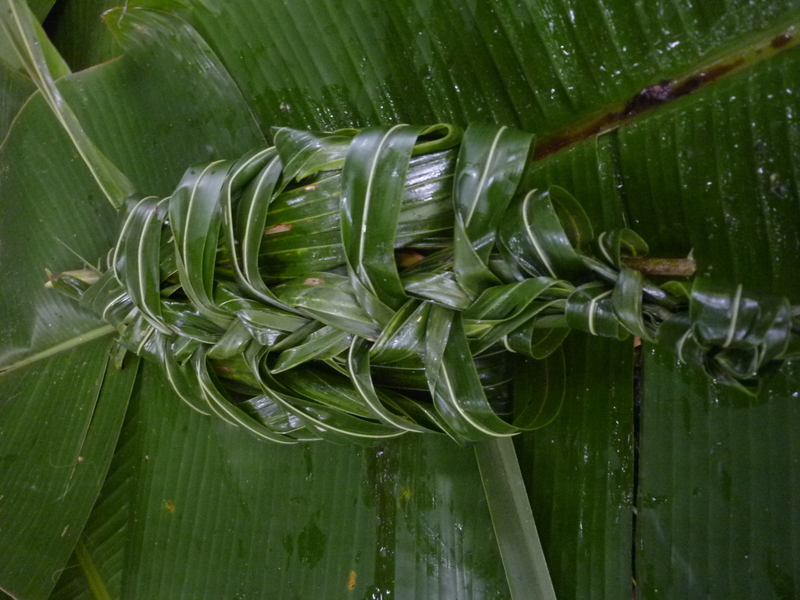 Everything is covered with more banana leaves and stones and left to cook for about 2 ½ hours. When it’s ready, it’s a feast for all! Just please do not ask us to plat dende leaves tight and effective enough to wrap a chicken and bury it without getting mud all over the meat! As with everything it looks so easy when someone has done it for so long, but when you try- no good! What was especially interesting in the lovo were the cases made from coconut shells cut in half, lined with leaves and then stuffed with fish and chillis. Who needs cooking impliments and tools when you have the jungle!? Local food in Fiji use a fast growing crop, which is a Pacific favourite and a staple vegetable known locally as “Dalo”, but globally as “Taro” (Colocasia esculenta) and “Elephant ears” due to the shape of its large leaves, which serves as an ornamental plant in many western countries. This plants root is boiled for a long time to produce a vegetable with a starchy and floury textured. If you do not wish to eat your home decorative plants then Dalo can be substituted in Western cooking by preferably using a yam (another starchy root vegetable), but if needs must then starchy potato like a russet is the next best thing. 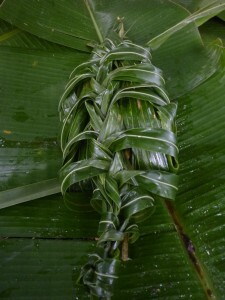 Dalo leaves can also be eaten, but if they are not cooked correctly the leaves burn and irritate the mouth, so they are always cooked for 20+ minutes and the water drained away to remove this property. 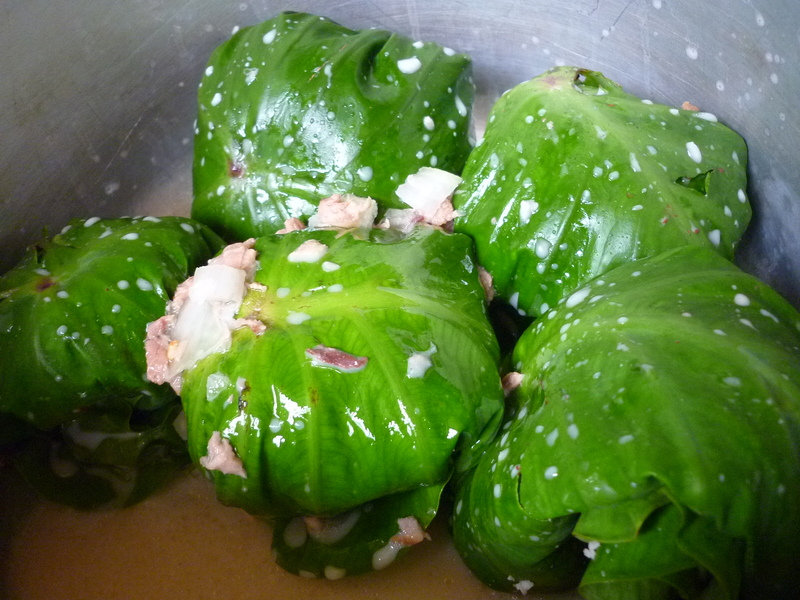 Bele or “Edible Hibiscus” as it is defined in the west is an unknown leaf used by the Fijians in their cooking. 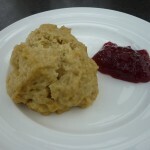 The leaf is fairly broad and soft when young, which means they are ideal to wrap other ingredients in. A good example of this is in Bele Miti where the typical ingredients; tuna, coconut milk, onion and tomato. Along with fiery scotch bonnet chillis there is the ever present, creamy and cooling coconut. 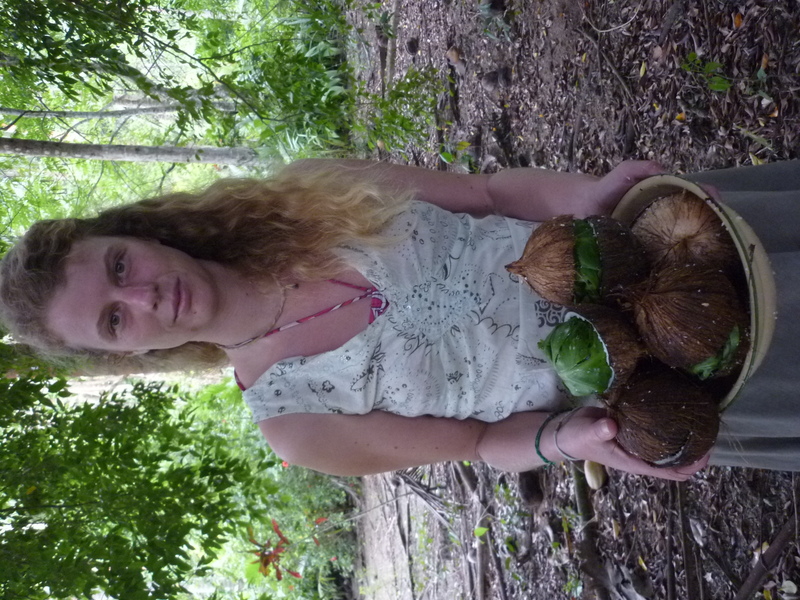 Making coconut cream is easy, but important to know as it is used in so much of the Fijian food. Take a fresh coconut and split in half over a bowl so the coconut water lands in that. Then either smash the coconut apart to reveal the hard coconut itself and grate the hard flesh using a grater with large holes into the bowl, you do not include any of the outer brown shell. Mix the contents of the bowl with your hands. Then pick up handfuls of flesh and squeeze to remove the cream from the flesh itself. Do this for a few minuted until you have turned the water into a deep white colour with a creamier consistency. 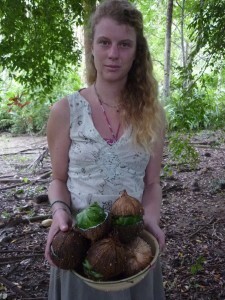 Everything in Fiji uses coconut milk unless it is roasted on an open fire, so hopefully you are not allergic to nuts! Our local food in Fiji were all quoted to be family favourites, with the steamed custard rolls actually being conceived by our host Gella. We love this idea as it is simple to make, reflects the Fijians love of sweet things and can easily be replicated in the west.